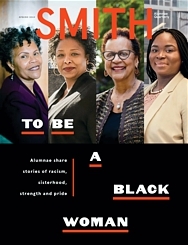 Welcome to the digital archive of the Smith Alumnae Quarterly. On this page, you’ll find the latest issue of the magazine as well as every issue since 1909. We’ve scanned and digitized our entire archive, making it not just readable but highly interactive. We invite you to explore the archive and send us feedback about your experience. begin the tutorial in the pop-up window. You can also access the tutorial later by clicking the issue’s menu icon (found in the upper left corner) followed by the help icon, or refer to the How to Use Our Digital Edition PDF. Send an email to saq@smith.edu. We’re happy to help.